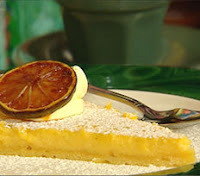 Lime Mascarpone Tart becomes a Key Lime Coconut Tart! Today's inspiration comes from http://www.cheesematters.com.au/recipe.aspx?id=2065. I am always in the mood to make a good tart. Not only are they fun and easy, but they always seem to come out beautiful. It might be the ridges in the pie pan that get me every time, but tarts are always a pleasure to look at and people think you always spent so much time on them without realizing that they take next to no time to prepare! So here goes my easy new recipe. Key limes are so much more flavorful and why not mix them with a little coconut for a completely tropical dish. Lightly whisk together mascarpone, sugar and rind until smooth. Whisk in eggs, lime juice, and coconut until smooth and pour into pastry case. Bake at 160°C for 30-40 minutes or until just set. Allow to cool before removing from tin. Serve tart cut into wedges dolloped with cream. Blend flour, ginger and butter until fine crumbs form. Combine egg and sugar and add to the flour, blending briefly until the mixture just forms a ball. Turn out onto a floured surface and knead lightly until smooth. Roll out between baking paper to 2mm thickness and line a flat tin with removable base. Prick well with a fork and refrigerate for at least 15 minutes. Bake at 200°C for 20 minutes until a light golden colour. Allow to cool and use as required.